(April 23rd) ANI 1773, an Anisong and cosplay party! Thread: (April 23rd) ANI 1773, an Anisong and cosplay party! Presenting ANI 1773, an Anime Song & Cosplay Party! We are a group aiming to bring Japan's Anisong and Cosplay party culture to Singapore! Organised by our own people, it will be taking place in CJ's Bar, Sentosa on 23rd April (Saturday), from 12pm to 7pm! If you register your names now, ticket prices will be at $15 each or you can get 4 tickets for $40! Payment will be done at the door. If you enjoy Anime or Japanese music, come down as DJs will be playing them both in the original form as well as a remixes! Get transported to Japan through the power of Anisong and J-Pop as they are played back to back by DJs, just like how clubs in Japan spin them. Be prepared to hear songs ranging from retro anime songs to the latest season's, male/female seiyuu group songs, Vocaloid, as well as J-Pop and idol groups! You can come dressed as if you are going to an anime convention: In cosplay, in light gear for jumping in a concert, or just simple, lazing at home clothes. Enjoy the songs in whatever way you want: besides singing/shouting/jumping/dogezaing, you can also run to the front if you are cosplaying the anime the DJ is playing, like the song the DJ is playing, do wotagei at the climax, dance the odottemita song, no one's judging you at such an event, but make you do not hit anyone, or spill anything! Experience underground idol lives the way it's meant to be! 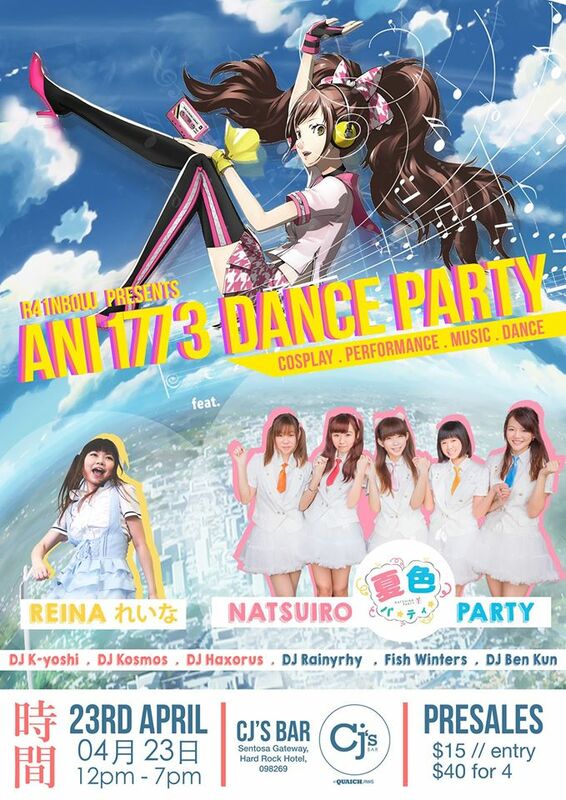 Reina as well as Idol group Natsuiro Party will be singing and dancing in the breaks between DJs. Also see the beauty of an synchronized wotagei group performance! As this is a all-ages event, alcohol will not be served, so you can only get drunk through the songs. FLOW "THANK YOU" PARTY - 23rd DEC SAT @ Gashaus!